Alien species in Brooklin? Sure, as there are in most places around the world. As Europeans settled in and changed the landscape of North America, opportunities for the spread of flora and fauna increased. Coyotes and Brown-headed Cowbirds moved in from the west of the continent. Ring-necked Pheasants, House Sparrows, European Starlings, and earwigs were brought from Europe. Many of our wild plants are not native and some of these alien species are quite invasive. Purple Loosestrife and Dog-strangling Vine are present but not yet abundant. Common Buckthorn, Black Alder, and Manitoba Maple are some of the numerous non-native trees in the area. Because the valley succeeded from open pasture, a native seed bank was not present allowing the Common Buckthorn, in particular, to dominate. Non-native species like buckthorn out-compete native plants and provide poor habitat for wildlife species. Many buckthorn trees were removed by experts with community help in November 2000 and replaced with native species in May 2001. Have you ever seen a pet turtle? Some people let their turtles go into the wild. The problem is, most pet turtles are native to the south-east of the United States and do not belong in our creeks and ponds. Never release pet animals into our environment. Look for tall plants with purple spikes of flowers. 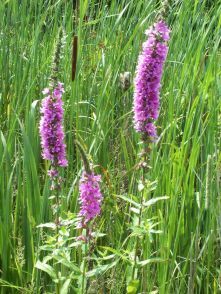 This is Purple Loosestrife a plant that came from Europe and is displacing many of our native plants in our wetlands. Many of the trees that are nearby were not here 200 years ago. With the arrival of the European pioneers came many new trees. Try and keep an eye out for the trees that were here before the pioneers: maple, oak, pine, cedar, birch, hemlock, ash, and poplar are some examples. Get a bird book out and look up the following: European Starling, House Sparrow, and House Finch. These are winter birds that have come from different places. Our most recent arrival, the House Finch was originally from the deserts of the south-west of the United States.